Oh what a day!! After a number of grueling weeks at work we finally said goodbye to the 2015 season. Today was my last day until Jan. 11 and I for one can't wait to get into full relaxation mode. Add to that, I caught up with my friend who was let go from his work duties a couple weeks ago. It was great to catch up with him and he's in a really good place. We're both looking forward to what 2016 can bring. Add to that, I finished a good book today. I'm happy to get back into the reading thing (it'd been far too long since I sat down and did some good page flipping). It was a nice quick read and I finished it in a couple days. Now I'm ready to tackle a new hockey book - Hockey Night Fever: Mullets, Mayhem and the Game's Coming Of Age in the 1970's......right up my alley. Add to that, my niece and her high school marching band put on their Christmas performance tonight. I always get a thrill out of watching her play music. She even had a solo tonight that (dare I say it) took my breath away. It was awesome. Add to that (last one), I won $300 in said high school band's fundraising raffle. Boo......yah!!!!!! So I can say pretty confidently that I'm pumped. Feelin' really good about things. So I won't let the fact that my scanner crapped out on me get me down. I improvised with my cameraphone. Had to show off some cards from trade night on Thursday. In addition to some new Linden cards (will show those off on the weekend), I landed two new autos for the HHOF hardsigned signature project. Yup....he's in the Hall Of Fame. And I think he's still bringing in a decent salary from Philadelphia? Arizona? Who? Don't know....don't care. He's an anomaly when it comes to the contract rich players out there. He'll never play another game again due to his career-ending eye injury, but his resume speaks for itself. And he had a pretty good career on the ice too. Hey-oh!!!! I had tracked down a different Pronger auto that I was originally going to chase, but when I saw this beauty I had to swap it out. This card is totally throwback. Comes from 2000 I believe. Not a big ticket card by any means so it was a painless trade. Another one of those "Oh yeah....he's in the Hall" type of players. I never really followed Blake's play much during his career, but he did have 777 points and a crapload of PIMs so he must be worthy. 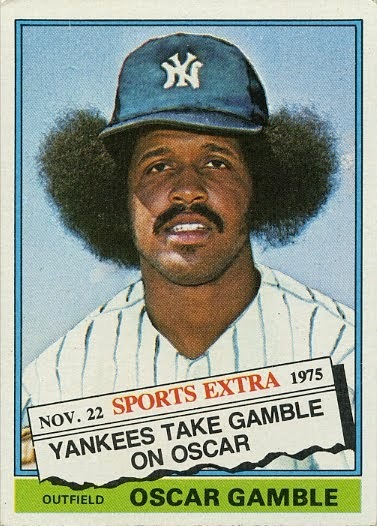 This card was another one of those easy pickup deals. 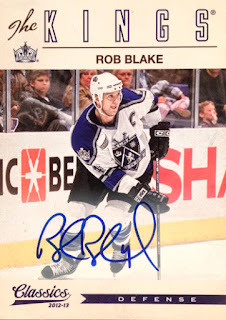 Who needs a Rob Blake auto these days?? Not me anymore. Both guys scribble it up nice - just past the time when autos were legible. They both saw the dawn of the auto market in sportscards. Too bad really. It would've been neat to see what they're signature would've looked like if they took their time. Nonetheless, it's two more to the archives. 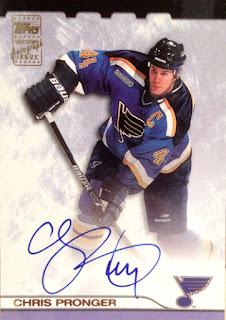 Getting me closer to my goal of 100 hard signed HHOF hockey cards.